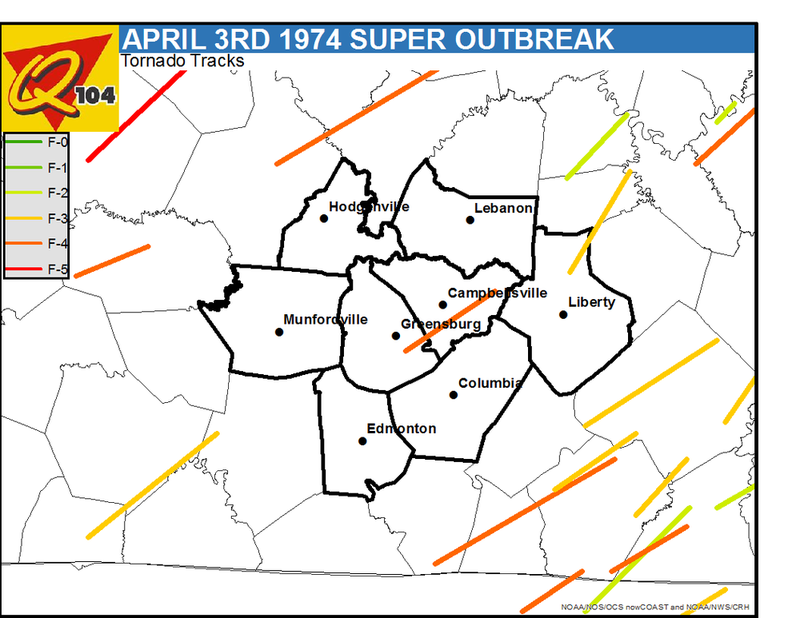 The April 3rd, 1974 Super Outbreak was the second largest tornado outbreak on record in the United States, and it was the largest tornado outbreak in Kentucky. On April 3rd, 1974, 148 tornadoes touched down in 13 states, with 30 tornadoes reaching F4 and F5 Intensity. 315 people died, and around 5,500 people were injured in the United States. How did this outbreak happen? It started as a powerful spring-time low-pressure system developed across the plains on April 1st. As it moved into the Ohio Valley, warm moist air from the Gulf of Mexico collided with this low-pressure system, which resulted in the 1974 super outbreak. The National Weather Service was expecting severe weather on this day, and had provided some warnings, but was not expecting an explosion of what ultimately occurred. Below are the tracks of all the tornadoes that were recorded on that day, along with their respective intensities. The CKNJ issued a very telling newspaper a few days later, with an image of the tornado by Willard Wise near Elkhorn. Tornado Outbreaks like the one in 1974 are very rare and usually occur once in every generation. Do you have any stories from this day? If you do, let us know!